Published by Watson-Guptill, New York, N.Y. This is basically a how-to-do book explaining and illustrating a technique I accidentally stumbled upon during a film editing session. The film sequence showed a little boy running with a dog in tall grass. We stopped the action to discuss the editing and the monitor showed a slightly blurred picture of the action. I asked the editor if I could have a clip of that sequence. Returning home I studied the sequence and readjusted the composition on paper and that was, in short, the birth of the idea of capturing motion in watercolor. I did step-by-step demonstrations for five different subjects with text explaining how and why I did with each step. 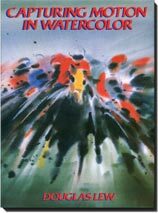 I included numerous drawings and a gallery of paintings totaling more than 300 illustrations in 144 pages. The book has since been translated into French and Korean, and it was a pleasure to be invited to exhibit in Lyon, France, in 1990. I also received a commission from Paris to use some of my existing images for a calendar. A six-minute video documenting the accurate sequence of bullfighting from start to finish. Over 250 drawings were rendered in preparation for this video. A total of 140 drawings were used in the final edit. All of the drawings were made by felt tips and pen-and-ink, rapidly drawn on 5-inch by 8-inch sized paper. Only a handful of famous matadors are shown. I selected music of Rodrigo, Albeniz, Spanish Fandango and Farruca. It won a Merit award at the Houston International Film and Video Festival, Houston, Texas, in 1991. It went on to be accepted by the Bilbao Film Festival in Bilbao, Spain. Since then, the number of drawings has grown to more than 400 in preparation for a book. In September 1992 I had the good fortune to rent a house from a friend right in the middle of Florence. Now for the first time my wife and I can settle down in the city and enjoy what it was like to actually “live’ in a city; to walk the streets, to shop in the markets, to cook our own food and to entertain friends.I carefully packed a small watercolor set and a small pack of paper in a canvas bag weighing only 7 pounds. I had two purpose in mind: one, to record many sights as quickly as possible; and to accumulate a body of sketches as examples for my students at the University of Minnesota where I teach the use of watercolor in architecture. As time went on, I found that copying the sight was increasingly less satisfying to me. The desire to compose for a better “picture” was always there, urging me on. Copying seemed somehow incomplete. Perhaps I was unconsciously reminded of someone who said that an artist will be reminded for his vision and not his recording. These sketches are not, by any means, a complete recoding of Florence. It was only one artist’s exploring eye. I painted and drew what caught my fancy. In fact, as time went on, I found myself attracted less to historical sights and more to ordinary things that offered, to me, more interesting paintings. While I changed and simplified some of the details of the sights, I did try to capture the look, smell and feel of the place. The book is in both English and Italian. It can be purchased by dialing 1-800-252-5231. The distributor’s name is Antique Collectors Club, Eastworks, 116 Pleasant St. Suite #603 Easthampton , MA 01027. The human body is probably the most observed object in the world. Every tilt of the head and bend of the torso, every twist of the hip and crook of the knee, every cross and turn of the leg, every curl of the finger-in short, every standing, sitting, squatting, and reclining position of the body presents an infinite variety of views and drawing challenges. The human body offers the challenge and answer to the problems of perspective, foreshortening, proportion, volume, solidity and accuracy. This book is the result of 4 years’ of weekly attendance of a life drawing co-op. This co-op was and is being held at an artist’s studio where any artists and aspiring artists of all walks and levels gather to draw and painted from a live model and share the cost of the model fee. The average number of poses during an afternoon session is around thirteen to fifteen with poses lasting from two minutes to twenty and occasionally forty. 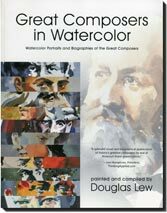 The book is a chronicle of progress in several stages: from a single line drawing to the gradual modeling of the figure, from a minimal to full use of colors, and from the elements that constitute a painting, including the transformation of the figure from a realistic to an abstract painting. The final chapter is devoted to portraiture. Each stage of the development can stand on its own, be examined, enjoyed and understood. And since every stage is done from life, the resulting work has a sketchiness and looseness which each artist can develop his or her personal treatment. The book is published by Watson/Guptill and is being carried by The National Museum of art, The Boston Museum of Fine Arts, the Chicago Art Institute and other Museum in the country. The overriding objective is to arrive at the truest possible likeness of these composers so that the viewer can look at each of them and say; "So, that’s what he looks like!" My second objective is to make these watercolor portraits more interesting in primarily three areas; in colors, in composition and in treatment. 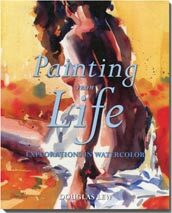 The large number of images available from public libraries and from the internet were in black and white and that, fortuitously, allowed me the freedom to use a variety of colors more expressively. 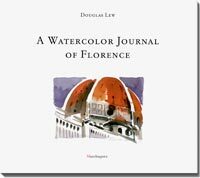 In composition, I wanted all of them to look more like a painting, and more importantly, to contain the unique qualities of the watercolor medium – free flowing, organic, and transparent. In composition, I did not always place the head in the middle of the page but in various positions and sizes on the page so that other elements of shape, texture, and color can be used to enliven and enrich the rendition. In the treatment of these portraits I followed my own instinct to give them a feel of contemporary realism; not a slavish copy of black and white photos with similar size heads and similar finish but a document that is well researched, accurately portrayed, and interestingly presented.